I started out my week in the dentist’s office for a teeth cleaning, so breakfast was delayed. Once home, I scrambled up some eggs with cheese and onion, before setting out for work. Around noon, my hurried breakfast was all used up and I was pretty hungry. I ate 2 handfuls of almonds. Lunch was around 3 pm, when I microwaved some Beddar Cheddar sausages. Monday is trivia night. After visiting with my dad, I headed on up to Albert’s On the Alley. They have a HUGE chicken club salad which has become my carb-friendly trivia night staple. Albert’s makes the best pizza in town, but I always feel bad when I order it and butcher it by removing the crust. Better to wait until I can eat the whole thing – either because I’m doing some kind of break day, or because I have lost all the weight and decide to have a treat. So, I ordered the chicken club salad with blue cheese dressing. I could only eat half. Despite being overweight, I never had much of an appetite. My weight gain was due to eating the wrong foods, not too much food. I took the remainder home to eat for lunch today. Back home after trivia, Rick and I settled in front of the TV to watch Real Time with Bill Mahr while we ate our chocolate mousse dessert. Rick likes this treat a lot, so it is definitely going to be our nightly treat. Around midnight, I got really really hungry, so I ate 3 deviled eggs and a Carbquik biscuit. That did the trick and I was still under carb count for the day. Sunday morning was a little stressful. Friday night, I found an IM on Facebook from Rick’s cousin Bob in Valparaiso, IN. He said Rick’s cousin in Chicago had died. Rick wasn’t close with his cousin, but he did want to attend the funeral, which was today. Unfortunately, I forgot to tell Rick about the IM. Saturday night when I went to bed, I found the obituary posted on his cousin Bob’s FB page. UHOH. I emailed Rick (he goes to bed much earlier than I do, so I email him at 1 a.m. if there is anything he needs to know when he wakes up in the morning–it works for us). When I awoke at 8:30, Rick was looking up the last minute flights. Turned out we couldn’t get a flight back until Monday, so I couldn’t go due to work and other commitments. We hightailed it to the airport, and Rick made it in time for the 3 pm service. I was on my own, so I made the best of it. I watched old romance movies (Jane Eyre), I recleaned the kitchen and cleaned out the fridge. Then I did 2 loads of laundry, played around with old audio tapes from my 13th birthday (trying to record them and make mp3’s), and generally relaxed. Breakfast was 3 eggs with cheese and onions. Snack at noon was almonds. 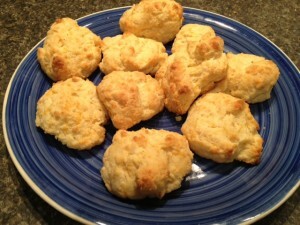 In the evening, I decided to experiment with the new Carbquik, and I made some cheesy garlic biscuits. They probably could have been cheesier, but they tasted similar to the authentic Red Lobster rolls. The texture and look were the same. The Red Lobster version is 17 grams of carbs, and this is only 2 grams, so it’s a nice substitute. I ate two topped with butter. I also made a batch of deviled eggs. I ate 3 of them with the biscuits in lieu of dinner.